Special Rate for Dads Club™ Now Through Father's Day: $20! Are you proud to be a dad? Do you want to promote responsible fatherhood in society? Are you looking for a community of other committed dads? Then the Dads Club™ is the place for you! 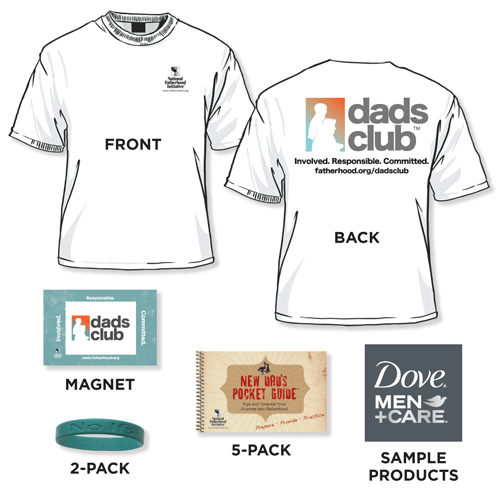 With a one-time $20 (regular price is $35) membership fee, you get an awesome set of Dads Club™ "swag" - including a set of men's grooming products from Dove® Men+Care™ - and can connect with other Dads Club™ members who care about fatherhood. Plus, your membership fee supports National Fatherhood Initiative's mission to create a world in which every child has a 24/7 Dad℠! A 5-pack set of NFI's Dad's Pocket Guide™ - pocket-sized advice for dads - share some with other dads you know! Exclusive monthly e-newsletter for Dads Club™ members - featuring tips for dads, member spotlights, and special messages from Dove® Men+Care™! Moms: Get the dad in your life the perfect Father's Day gift—you know he needs a new shirt and products to make him smell fresh!